On citywide sales weekend, you’re competing with many, many other sales for customers’ attention. Shoppers have limited time and just one resource to find out whether or not your sale is one they want to stop at. That’s why your sale description in the Master List is so important. 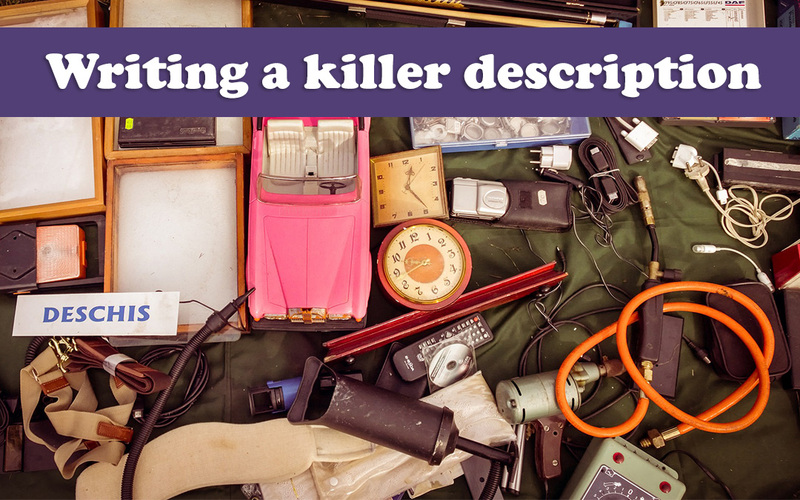 Here’s how to write a description that’ll fill your garage with shoppers and land your sale on people’s “Must Go There” shortlist. These all do a great job of using the “DOs” listed above. Lots of women’s clothing including size 8-12 jeans, medium to large tops, size 6-10 dresses, and size 8.5-10 dress shoes, athletic shoes, and boots. Girl’s clothes sizes 6 months-16 years. Power washer. Sports gear including slow-pitch softball, basketball, and swimming pool items. Matching bedding sets for queen size and king size beds. Baby/kids: Clothes sizes up to 2t, Rock n Play, Sit n Spin, basketball hoop, play kitchen, Barbie dreamhouse/Barbies, stroller/carriers for dolls, learning toys, dolls/doll clothes, stuffed animals, games, books, Bumbo, portable booster set, Boppy, pregnancy pillow, strollers; housewares: barstool, TV stand, decorative accents, art, and more. Clothing is 50 cents, unless marked otherwise!! Girls Clothes 9 months-7 years, Boys Clothes 3 months-5 years, Women’s size medium, Mens XL, Winter coats, dance attire/shoes, baby toddler toys/walkers/etc, Little Tykes Kitchen, toy Tool Bench with tools, Outdoor Playhouse, kids folding table and chairs. Pro mechanic changing careers. Tools: some new in box, some used. Tools: Mac, Snap On, Craftsman, Kobalt, Dewalt. Tool boxes. Motorcycle & snowmobile helmets. Moped scooter. Other guy stuff. JD 425 garden tractor, cab, 54” mower deck, 54” rear mount sprayer, 46” snow blower, rear weight box, tire chains. Category 0 3-point aerator; category 0 3-point fertilizer spreader; 48” drag/harrow; push broadcast seed/fertilizer spreader; 8½’ skid loader ramps; 8’ folding aluminum mower/ATV ramps; Mower/ATV manual tire changer; heavy duty floor jack; heavy duty rolling work table; radial arm saw with shop vac; 12 volt trim saw, 17” Weedeater CRT tiller; Ryobi mini tiller; assorted string trimmers; assorted chain saws; assorted small engine tools. These all employ one or more of the DON’Ts. Desk, home goods, baby clothes and supplies. VARIOUS VINTAGE & ECLECTIC HOME DECOR INCLUDES TIGER OAK CABINET, OAK MIRROR, MANNEQUINS, HANGING LIGHTS, CHALKBOARD, METAL TABLES, LAMPS, COAT RACK, PICTURES, WALL DECOR, FURNITURE, NEW & RECYCLED WOMENS CLOTHING, NEW MENS SHIRTS, JEWELRY, PURSES, STORE FIXTURES, WHIRLPOOL REFRIGERATOR, FABRIC, SNOWBOARD WITH BOOTS, CAR BIKE RACK, CHILD GATES, GIRLS DANCE COSTUMES, BASKETS AND VARIOUS HOUSEHOLD ITEMS. Multi Family Sale, Items for everyone. Priced to sell. Buildabears Barbies American girl doll accessories teen clothes m/f shoes m/f winter/fall jackets bell set.